The third segment of the U. S. Grant Trail is now complete. Travelers can now follow Grant’s life and career from Hannibal, Missouri to Paducah, Kentucky. 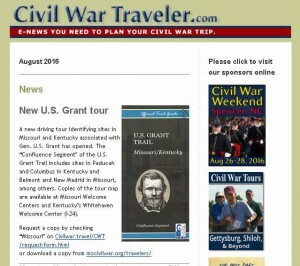 The U. S. Grant Trail is a joint project of Missouri’s Civil War Heritage Foundation and the Missouri Humanities Council, in collaboration with its Trail Cities and the Ulysses S. Grant Association. Our newest Trail Cities are Charleston, Bloomfield and New Madrid in Missouri, and Paducah in Kentucky.